Have you ever dreamed of diving on a single breath? where you can swim quietly, exploring the underwater world in total freedom, without the need of noisy and heavy equipments? Have you ever felt zero gravity, where you can 'fly' underwater, or where you can fall and glide like Superman? Those are just some of the sensations you can get through freediving. Freediving was practiced to gather food since the time men lived in caves, to harvest resources like pearls, and to reclaim sunken valuables. How do you think that abalone came to your plate? It is now one of the world's fastest growing sports, attracting people from many fields and creating over 200 competitions worldwide. More than just a sport, freediving focuses on correct breathing, relaxation, focus and mental control and as such can be used as a great complementary activity to other sports, such as underwater hockey, spearfishing, skin-diving, and many more. Although many competitive freedivers are able to hold their breath for more than 8 minutes (the current world record is 11:36), almost every normal human being, with the proper techniques, are able to hold their breath for more than 2 minutes safely. We are a small but specialized Freediving school based in Pemuteran, North-west of Bali. We are passionate about freediving as much as we are passionate about teaching, we are constantly learning and improving to provide better teaching method to be able to guide our students to become better, safer freedivers. Our training focuses on the fundamentals and understanding of freediving. Depth is useful and important as a performance requirements in a course, but it is not about the numbers, it’s about how you reach it that counts. With relaxation and good techniques, depths will come naturally. ​Ousia is taken from a Greek word which can be translated into “being” or “essence” in English. 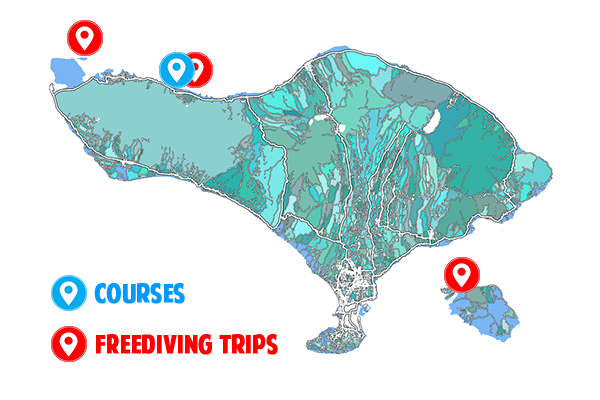 We choose it because we believe that high-quality education is the essence/core in freediving and it will provide solid foundation for freedivers to increase their freediving abilities and their safety. Pemuteran, Bali is the perfect spot for freedivers. Known as one of the best kept secret spot to dive in Bali, Pemuteran is a protected bay with warm waters all year round. Nearly born in the boat during a fishing trip, his attachment to the ocean is undeniable from the beginning. He spend most of his childhood holidays playing in the ocean, either fishing, swimming or snorkeling. He loves teaching as much as he loves freediving. His love for teaching comes from his professional background as a marketing consultant for more than 13 years. Taught over 500 freedivers, He is one of the most experienced Indonesian freediving instructor.